View More In Plug & Play Video Games. 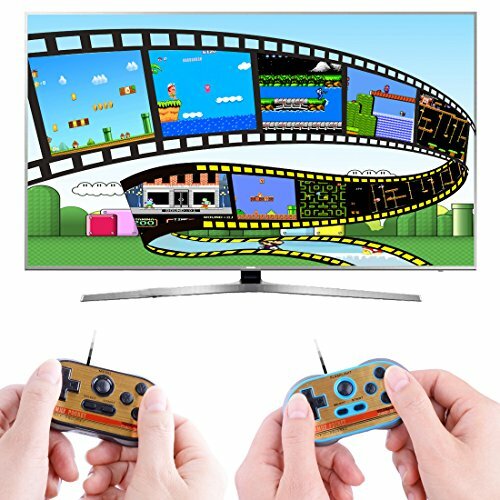 This ZHISHAN mini classic retro games controller is an newest version video game console. Built in 260 classic challenging games. Christmas gift for the kids and yourself are really surprise. 1. It supports double battle, but the 260 games not means all support double battle playing. 3. This mini classic game console is easy-to-use, but hard to master! It is the ultimate challenge for ages 4+. 1. Built in 260 classic video games. 1.Select / start and other functions, please operate through the main handle. 2.The vice console no games,all games are pre-installed on the host. 3. Not suitable for children under 3years old. 4. Fast after-sales response,30 days of replacement or refund. ★NEWEST VERSION - This mini classic retro games controller is the latest version that we are release on the Amazon. It allows for two players to play simultaneously, perfect for parent-child interaction. ★CLASSIC RETRO GAMES - Built-in 260 classic retro games, Plug and Play. No need to load the start-up disc, you and your kids can play happily right away. If you can play better than your kids, maybe they will treat you as a superman or a hero. ★PLAY ON THE BIG TV SCREEN - Get more clear pictures than other red and white consoles. So exciting and challenging, the feeling of body and mind to completely relax is really great! ★VALUE-ADDED DESIGN - As a decompression toy, it is also very fun and cool. As a flashlight, its brightness can reach 2000LUX, that enough to meet the lighting of Daily life. Incredible it is particularly power-saving and smart. Only need 1 AAA battery on the host, auxiliary can be without battery. If it is AAA lithium battery, it will charge while playing. ★WORTH HAVING - For this price, this iconic controller has great value. As a birthday, Christmas gift for the kids and yourself are really surprise. 100% satisfaction and unconditional return guarantee within 30 days. Please feel free to buy. Manufacturer: Shenzhen Good Source Technology Co.,Ltd. Publisher: Shenzhen Good Source Technology Co.,Ltd. Studio: Shenzhen Good Source Technology Co.,Ltd. If you have any questions about this product by ZHISHAN, contact us by completing and submitting the form below. If you are looking for a specif part number, please include it with your message.